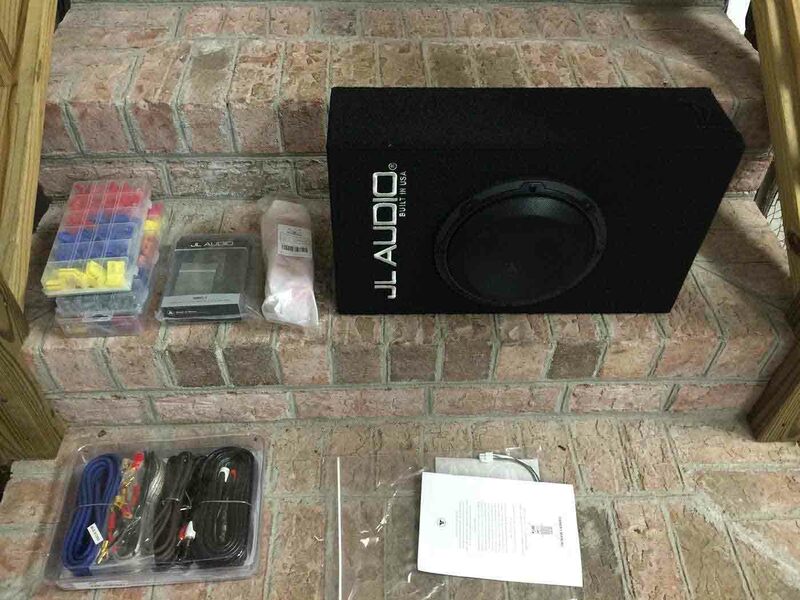 This Ford F150 2015 subwoofer amplifier retrofit is original by f150 forum members:Southpaw1227 & theLurker.Thanks for them generous sharing.Hope it is helpful to Ford F150 owners. 1.This was on a 2015 F-150 SuperCrew Lariat with MyFord Touch. 2.I have the stock audio system. No Sony, no navigation. 3.I wanted to keep the factory head unit so that all of my Sync and climate controls remain in tact. 4.This setup should work for anyone, regardless of what sub/amp you choose. 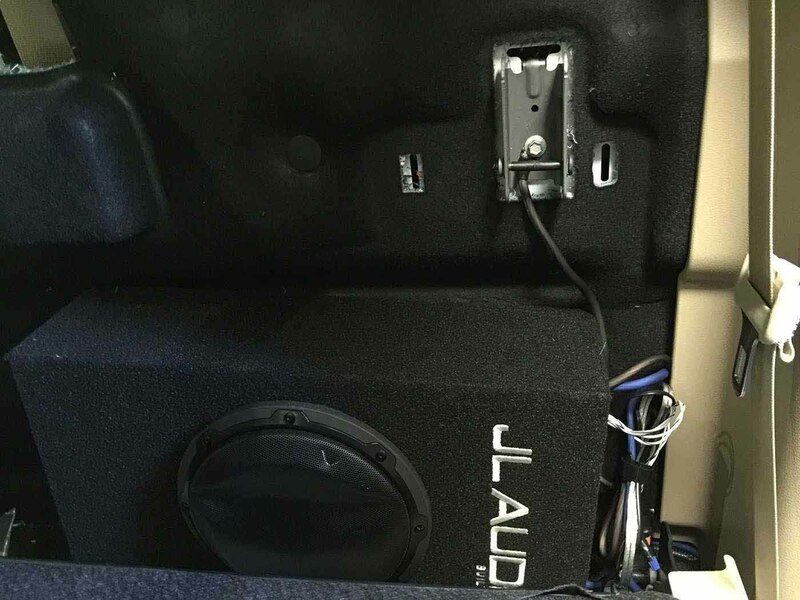 I installed a JL Audio ACP108LG-W3v3 (8″ sub, amp, and box all-in-one), which I ordered from Crutchfield for $429. I measured ahead of time and knew that it would barely fit, but I didn’t account for the change in space behind the rear driver-side passenger seat when you fold it straight up in order to access the flat floor for storage. So, while my sub fits snugly behind that rear seat and the rear seat latches properly, I cannot access my floor storage on that side. You can slide items underneath the seat when it’s down, of course, but it won’t fold completely upright. 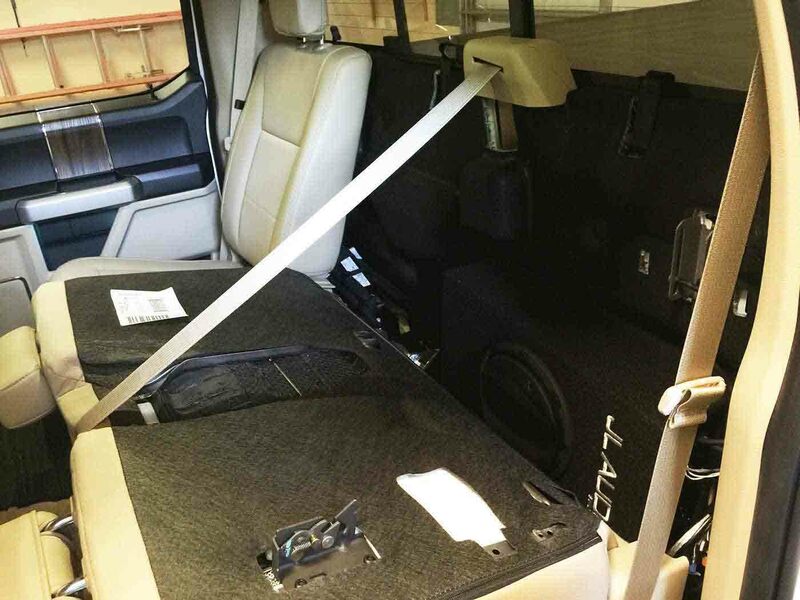 Because of this, I would avoid the JL Audio ACP108LG-W3v3 (despite it sounding absolutely marvelous), and instead opt for a Rockford Fosgate PS-8 or Kicker Hideaway, both of which are slim enough to be mounted behind the rear seat and still allow for fold-up access to the floor. – these guys only sell quality cabling. 8 gauge is plenty for your average 150W-300W amp with an 8″ sub. 7.A spool of 12-16 gauge speaker wire. 1 .Start with back seat up head rest down. Press the clip in on both the left and right metal rods and remove the headrest to get it out of your way. 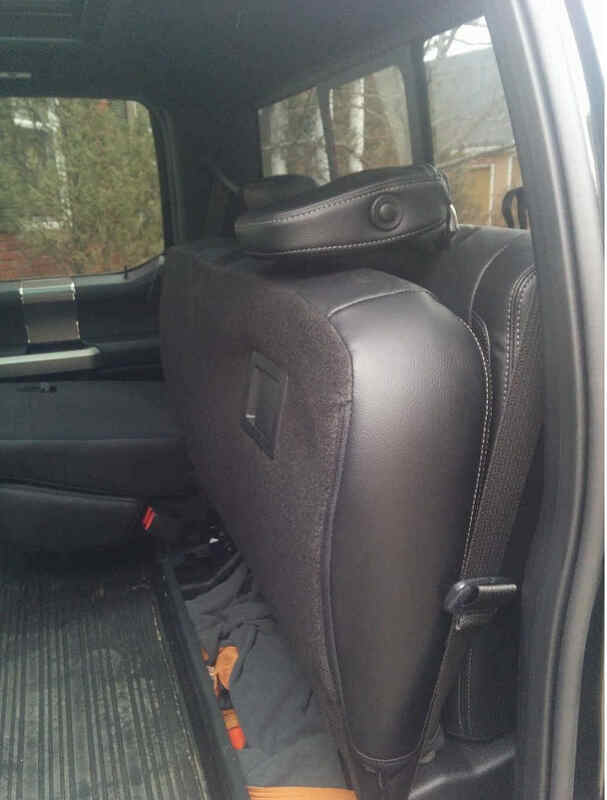 3.Lower the rear seat using the unlock handle on the bottom of the rear seat. 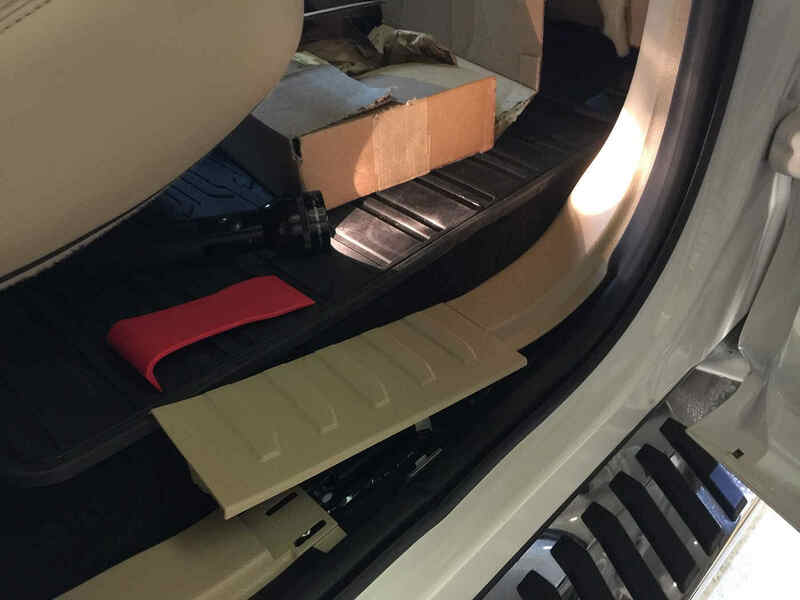 5.Use a molding removal tool to pry up the middle floor plastic plate in the front DRIVER SIDE door (leave the front passenger area alone). 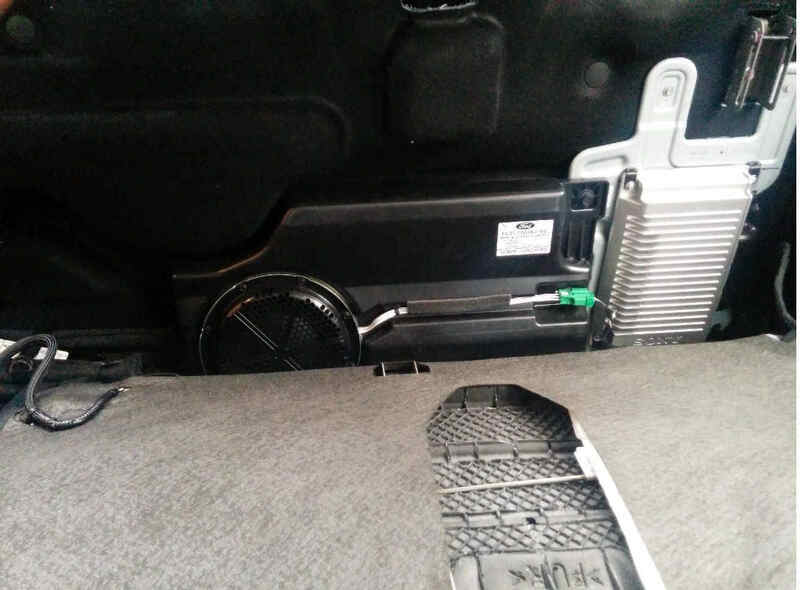 6.On the b-pillar, where the seatbelt enters the pillar area, there’s a recess. Stick your fingers in there, wiggle strongly, and pull back. You’ll unclip 4-5 clips along each side and free that up, exposing wiring that runs down the b-pillar. 7.On the right speaker side, unwrap the tape holding the bundle of wires down the b-pillar and look for the two wires that are very obviously twisted around one another. The POSITIVE (+) speaker wire is Brown with White Stripe. The NEGATIVE (-) speaker wire is Brown with Blue Stripe. 8.Run speaker wire from the rear of the back seat (where the amp will be) to the right b-pillar, hiding the wire in the door sills that you just uncovered. 9.Repeat this on the left b-pillar, but watch out for NEW COLORS. 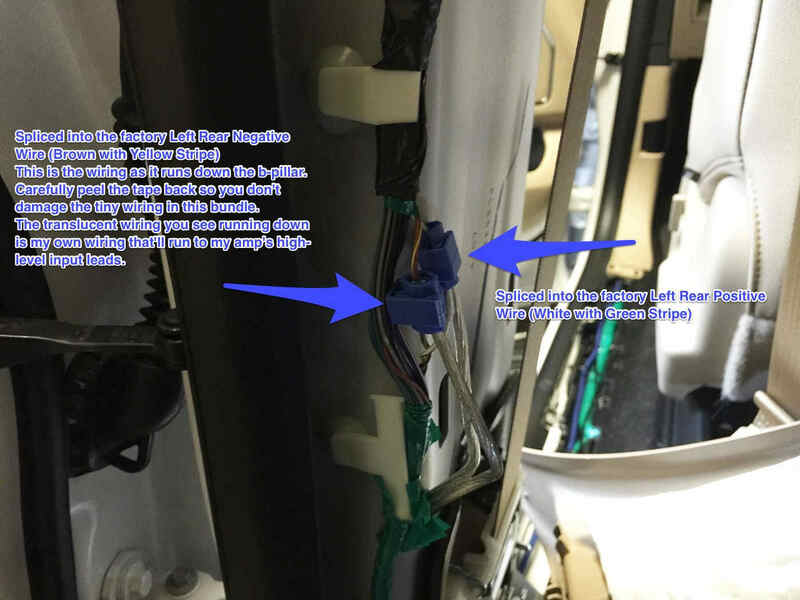 10.On the left speaker side, once you’ve unwrapped and exposed the wiring as it enters the cabin, the left POSITIVE (+) wire is White with Green Stripe, and the left NEGATIVE (-) is Brown with Yellow Stripe. 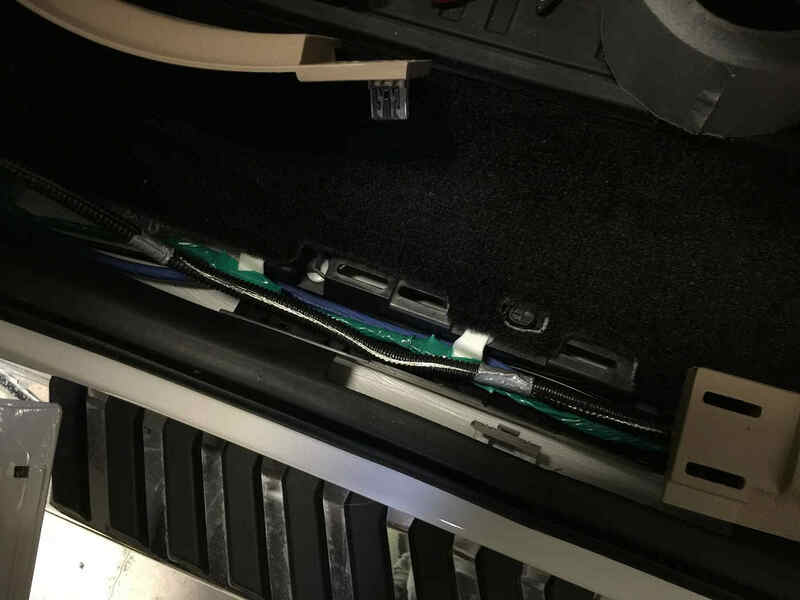 12.To run your 12v HOT wire to your battery, run your amp’s power cabling from the rear compartment where your amp will be along the newly exposed door sill on the DRIVER side. Just to the left of the brake pedal you’ll see a rubber grommet entering the firewall. This is the hood release cable. THIS is your easiest point of entry into the engine bay. 13.Tug on that rubber lead from the interior cabin with a set of adjustable pliars as to not cut the rubber. It takes a good yank to break the seal and create room for a power wire to get through there. 14.Once that plug is pulled, go around to the engine bay and tie a coat hanger or other stiff cable to your hot wire and pull it through to the engine bay. 15.You can run your hot wire along the front of the engine bay, taping it up top near the windshield so it doesn’t just drape across your motor. You’ll want to find a good place to wedge or tape your fuse holder, but don’t connect that hot lead to your engine battery just yet. 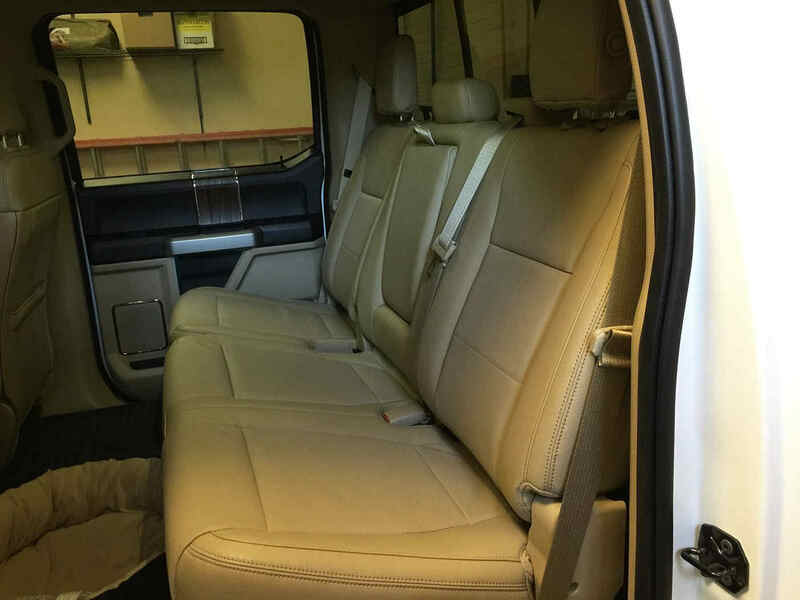 16.Back behind the rear seat, which should be folded down, unbolt the little latch that you had to mess with initially to get the seat folded down. There’s an annoying washer on the rear side, but if you take a hammer to it you can break that bolt free. This is an IDEAL place to attached your amp’s GROUND wire. Place the ground ring around that bolt, then re-attach that metal latch to the rear of the cabin where it came from. 17.Connect your ground to your amp. 18.Connect your 12v hot power wire to your amp. 20.Just FYI: buy an amp that can be triggered on/off via power sensing in your speaker wire. My JL amp does this PERFECTLY, thus you won’t see anything here about running a remote wire. If you must run a remote wire, you’ll need to buy an Add-A-Tap and use slot #38 in the passenger kick panel or slot #95 under the hood. 21.Connect your 12v hot power wire to your battery and cross your fingers. 22If everything works, adjust your gain, situate your amp/box, put the seat back up, and enjoy. No wrench, no screws, no door panels to remove. JL box installed with seat folded down. 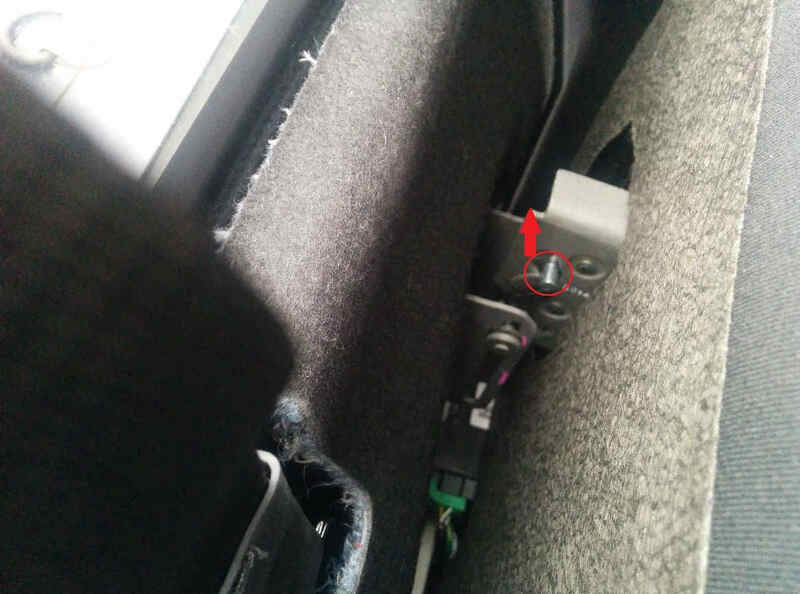 Closeup of sub install + ground connection to rear seat latch. Completed project with seats back upright. I spent A LOT of time hunting for the ideal 12v power wire firewall point and the ideal spot to tape into the rear speaker leads, and I hope this saves all of you DIYers a lot of time and hassle. My hands are shot, my back aches, and I’d probably recommend that really busy folks just take it to a professional and pay them to make your day easy. But for everyone else, it ain’t too bad now that you’ve got the blueprint. As for the sound quality of the JL: while I can’t recommend it due to it killing your ability to access the lie-flat floor storage, it sounds amazing. Super clean, super crisp, and super tight. It won’t “hit” like a 12″ woofer would, but no 8″ woofer by its lonesome will “hit” those really low bass drops in rap and EDM music. That said, it sure hits a lot harder than the factory woofer in a Land Rover LR4. Honestly, adding an 8″ sub isn’t about rattling the mirrors; it’s about adding an element to your music that’s missing from the factory. I love that my setup doesn’t rattle my doors. Even at a loud volume, everything’s tight, and I didn’t have to add Dynamat to dampen anything.